This plant has gorgeous pink and purple flowers that stand out against its green foliage. It has high salt tolerance making it ideal for the coast or places high in salt. 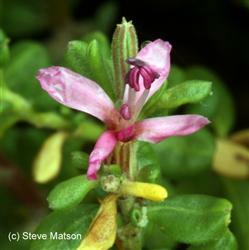 It is a perennial shrub and grows to about 3'. great photos try this one!